I have never even thought about making my own cheese until I had this amazing appetizer at a local restaurant here. I wanted to go home and recreate it immediately, but knew I would have to have a quality ricotta cheese. The store-bought stuff wasn't going to be good enough for this, so it kind of got pushed back in the "to try" file until I got around to making my own ricotta of finding a good one. Well, I saw this post on another site and knew I had to make it. I finally got around to it when my cooking club was going to meet and the theme was "local." 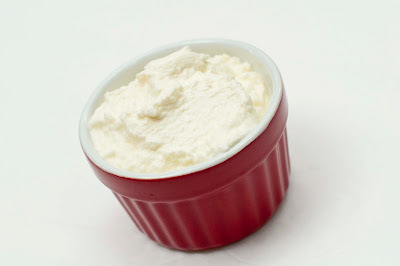 I had planned on making an appetizer that used "local" honey and this ricotta cheese. This stuff turned out amazing. It was so tasty! And let me tell you this, it wasn't hard to make, I promise! I don't have cheesecloth, nor do I know where to find it at the store (I've been told that it's easily found in grocery stores.) so I used a coffee filter over a mesh strainer. You need to make this, I'll post the appetizer that I made soon, it was very easy too, and quite the hit at cooking club. Yum!! Pour the milk, cream and salt into a saucepan. Attach a candy or deep-fry thermometer for ease. I don't have either of those, so I occasionally put my meat thermometer in the mix to test the heat. Heat the milk to 190°F, stirring it occasionally to keep it from scorching on the bottom. It got to 190 just as it was starting to boil. Remove from heat and add the lemon juice, stir it gently and slowly. Let the pot sit undisturbed for 5 minutes. Line a colander with a few layers of cheesecloth or a coffee filter and place it over a large bowl (to catch the whey). Pour the curds and whey into the colander and let the curds strain for at least an hour. At one hour, you’ll have a soft, spreadable ricotta. Let it strain until it is at the consistency that you like. It will firm as it cools, so do not judge its final texture by what you have in your cheesecloth or filter. Eat the ricotta right away or transfer it to an airtight container and refrigerate until ready to use. Me too; I love to go home and try to re created something I enjoyed. What an easy and fun recipe; thanks.